The much-awaited true sequel to UFO: Enemy Unknown... that fell flat as the vastly ambitious design goals made it in only as half-assed gimmicks or were forgotten altogether. There's a large pile of unused items left behind in the research tree and market listings, ranging from bare text entries hidden in the executable to instances of functioning items found only in corporate raids. These were officially removed, but someone forgot to purge the loot tables for a few raid targets. A clunky Mind Bender-lookalike that increases an agent's psi-defense when held and activated, as the half-assed UFOpedia page says. The effect is bugged so that any agent leaving the battlefield with it still armed and running will have the +30 bonus permanently added to their stats. They were officially removed from the retail version, but some are still lying around on Marsec property. A large energy cell that looks like two laser rifle magazines stuck together. 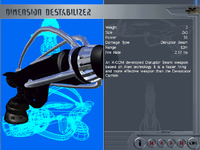 Its mostly purged UFOpedia entry suggests it's a magazine for a man-made Devastator, the market entry connects it to the disabled ForceWeb weapon and they can be found in Transtellar facilities. Pick a theory. Not found naturally in the game. May or may not actually do anything, but these definitely exist and can be readily save-edited in. Some UFOpedia remnants are left in as well. A small Motion Detector-like. Its alien detection effect still has an entry in the executable's tables, but it does nothing. Possibly used to scan important figures for signs of micronoid mind control or an extension of the tracker system. The only handheld human replica of the alien disruptor tech. 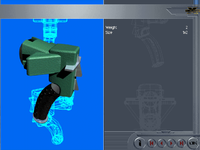 It fires 5 shots in the time a Devastator can manage two and sits between the two alien guns in terms of power. A probable pair to the Energy Pod, but the discrepancy in numbers and the fact it recharges like the alien units might mean that this rifle was complete enough to have its stats balanced before getting cut. 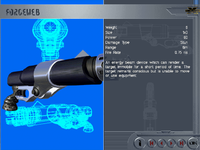 A large man-portable device with a pointy energy weapon emitter. Like the Alien Detector, it has a unique effect that's been purged with no other clues. 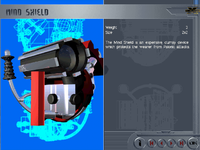 It could've been an X-COM version of the alien disruptor shield, dropped like the Destabilizer in favor of alien exclusivity, or a portable force field generator to summon energy barriers that was abandoned as too fiddly. A meek stun gun. It makes Power Sword noises, doesn't have the blue zap effect and has inferior stats to the Megapol Stun Grapple. 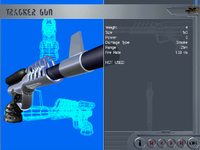 The design similarity to other X-COM weapons hints it could've been a superior version of the even worse (at the time) police stun rod, but was dropped completely in favor of the stun grapple being as good as it could be without further research. A remnant of the ambitious political drama hyped up during development. Has something to do with monitoring the movements of bugged individuals, but the system never materialized. A dart gun that would've let you implant small tracking devices into gangsters, politicians and other potential alien colluders for whatever reason. 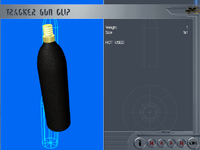 Expends special ammunition whose stats say it does Smoke damage for some strange reason. 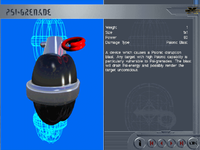 A unique grenade that blasts the targets with a deafening psionic shock, possibly intended as the specific means to stun dangerous psi-creatures too strong for tear gas. 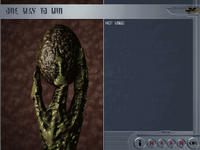 Probably cut due to the final game counting psi-responsive aliens on one hand's fingers. Manufactured by Marsec. 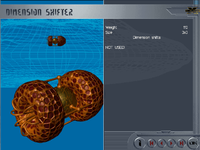 Inert vehicle equipment that "dimension shifts". 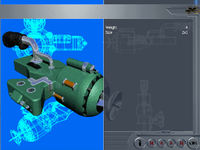 The alien design suggests that permanent dimensional gates came into development late enough to obsolete completed assets. 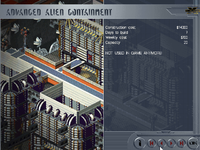 A large 2x2 version of the Alien Containment to complete the set of advanced science facilities. Since the tiny holding tank in the retail version holds as many mooks as this quad unit, the whole rigamarole of researching bigger containment areas might've been cut as pointless. 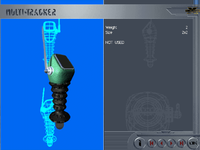 The basic room took the capacity that the game was designed around and these assets were left behind. Holding cells for human prisoners! 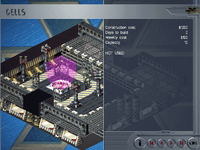 Blackmailing corporations with infiltration evidence or hostages, undermining criminal organizations, interrogating Sirius cultists... who knows how much the developers promised to deliver with this system. The flags in the building tables hint that this was unlocked through research. 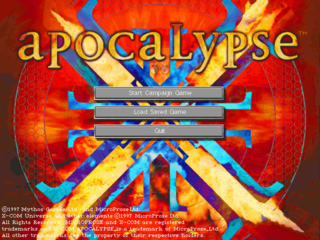 Only seen via hacking the executable with specific tools. The basic save editors can't see them. An item with a special ProbeStructure function. Same story as above. Unique effect, nothing left sans its place in the market list. Sits right next to Elerium-115 in the market list, with double the value. Before the dimension gate disruptor dimension energy hooplah went in, the game probably followed the tradition of discovering an alien magic substance that powered their supreme alien magic tech. The numbers can be tweaked to "stock" it in the open market, but it's so inert that nothing happens. Only visible by flipping the "unlock" flags with an editor. 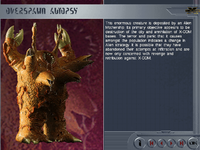 As with any creature, even the Overspawn has its "live" analysis with less anatomy and more motive and function. Of course, since you can't exactly capture this thing, you'll only ever see the "autopsy" results of bombarding one into pieces. This is the very last discovery in the Alien Dimension category, even beyond the Real Alien Threat. Before the endgame consisted of gradually slaughtering the alien war machine one organ-building at a time, the original design might have involved a climactic "Cydonia or Bust!" type no-turning-back invasion in the vein of the first game. 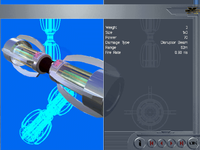 The picture seems to depict an immature pod in the Megapod Chamber, the last alien target before the final battle to destroy the dimension gate generators. This page was last modified on 16 February 2016, at 16:07.